I know I'm a bit late, but since the Miami Heat are enjoying their victory parade today, I thought I'd offer some reflections on their championship. First of all, to get it out of the way, "CONGRATULATIONS Miami LeBrons Heat, You're the best in 2012!!" In his first year with the Heat, LeBron stunk it up in last year's finals against the Dallas Mavericks. He seemed an awful long way from 5, 6 or 7 championships! He still is a long way away, but he's that much closer now. The Thunder won the first game in the NBA Finals. That was the only game they won in the series. Even in their lone win the Thunder were down by 13 with just a few minutes to play. They won by 11. In the West Conference Finals the Thunder trailed the Spurs 2-0 after two games. They won the next 4. Game 3: The Thunder had a 10 point lead in the 3rd quarter in Miami, but Durant found himself on the bench with 4 fouls and before you could blink the Heat took the lead and finished out 91-85. Game 4: Russell Westbrook explodes in the first half and the Thunder at one point led by 19 points. He scores 43 total points and the Thunder would have been buried without his contribution. Then in the last couple of minutes he turns the ball over, dribbles it off his foot, and fouls when he should have let the clock run down. Sadly the last few minutes will be remembered much longer than his dominant 43 points. This was the first NBA Finals for Durant, Westbrook, and the Thunder. They're a young team and most pundits believe they'll have more opportunities to hug the golden ball. They're hoping they can finish their careers stronger than they've started them. 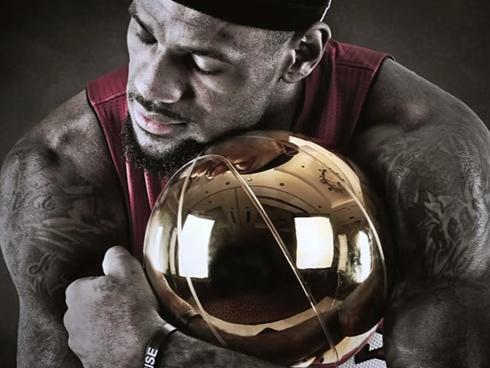 If last year LeBron had a horrible Finals, he made up for it this year when he won NBA and Finals MVP. After losing in the Finals last year the Heat had their eyes fixed on a goal. When the chips were down, they persevered. They won. God wants us to fix our eyes on the goal of living for Jesus. If we persevere in our quest for that goal through difficult times, God will make sure we get there. It's not how we start, it's all about how, and if, we finish.